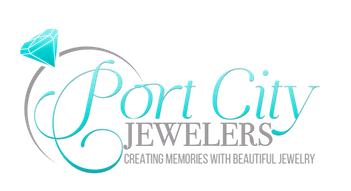 Port City Jewelers offers unique and affordable jewelry to our lovely customers! We have been in the jewelry business for 30+ years combined and have created respectable relationships with vendors and suppliers across the globe. Port City Jewelers also offers custom designed jewelry, engagement rings, using eco friendly conflict free NEO Moissanite, Eternal Moissanite and Charles & Colvard Forever One Moissanite! We also work in genuine diamonds, semi precious and precious gemstones. Our specialty is designing and creating pieces that you can be proud to wear! We love to involve you in the entire process! FOLLOW US on social media below! We love to post content their daily! Port City Jewelers also offers all the normal jewelry and watches as well just in case you need a easy quick gift for that someone special in your life. Our store is filled with all kinds of trendy and unique jewelry. We offer many different respected brands! If you have any questions connect with us below. Head on over to our CONTACT US page with any questions..